I purchased a MagnetoSpeed V3 to do some MV recording on some factory ammo that I shoot (mostly FGMM). Specifically, I am trying to capture the MV differences, based on the temperature of the cartridge. This will help me dial in some ballistic firing solutions for my rifle at various ranges. I was curious if I could artificially introduce cold/hot temperature change differences to the cartridges and use that data? For example, could I seal 10 baggies (5 rounds in each bag) and put it in a cooler of salt/ice, lowering the temperature of the cartridges to say 30o. Then, remove one bag and shoot 5 rounds at the ~35o case temperature to record the muzzle velocity. Then, grab another bag and let them warm up to say 40, and shoot them - record the results. Repeating at each 10o F interval. Ultimately, collecting a broad range difference in case temperatures. Using 3 or 5 rounds each as a control test for MV (taking the average?) - should give me the necessary data I am looking for - right? I am only trying to capture the initial MV - not the external ballistics atmospheric influence of the actual outside temperature. Anyone see anything wrong with this approach? I don't have the time to spend a year or travel to various different regions collecting this data. It will work a little bit. The temp of your action and chamber will influence it pretty quickly. If the ambient is pretty high the increase will be faster. Do you have a laser temp meter? You will need one. IM me your email and I will send you a file with MV temp curves. Not exact, but a really good start once you start plugging in data. Also, the chamber will heat up your rounds quick! I suggest loading the rounds one at a time from the magazine. let the bolt slam shut, the fire immediately. You just want velocity as a function of temp correct? I am looking for velocity changes due to cartridge temperature changes. I figured if the action/chamber was hot, it would give me little time to work with, so this would definitely be a "take your time" sort of test. I probably would wait multiple minutes between shots to try to keep the case as cool as possible or at the desired temperature. I don't currently have a temp gun, but that is what I had planned on using to measure the outside case temperature. I figured that I would seal the rounds waterproof and let them sit in the cooler for 8 hours or so, to insure that the powder, primer, brass case, and bullet were all equally at the same temperature. For the subsequent temperature tests, I figured I would remove a round and let it sit in the shade/sun and slowly start to warm. As the brass came to the next temperature - I would quickly drop it in the chamber and shoot it. I figure, I would shoot three (3) shots at each temperature bracket and record that data. I would average out the MV for each bracket and use that average for all ballistic calculations. question: Muzzle Velocity changes, by case temperature differences, is not linear - correct? For if it was linear, I could just do one or two measurements and calculate the chart line. Yet, I figured it wasn't based off of some marketing stuff I have read. I read one gun powder manufacturer state that they try to be more tolerant or less susceptible to Muzzle Velocity changes from a few degree of temperature swings. This made me think it wouldn't be a linear change then, if they could control that? Ultimately, once I have this information - it should be the final piece of the ballistics puzzle for my rifle. I should be able to enter in the various inputs and accurately project terminus at very long ranges! 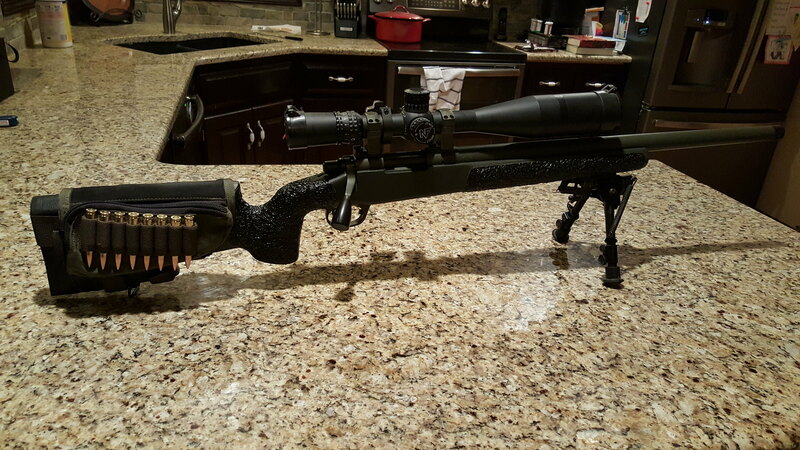 Nice rifle! Dry ice might be better.